NUR-SULTAN – RostOk inclusive kindergarten, which provides rehabilitation for children with autism spectrum disorders, hearing impairments and speech and movement disorders, opened April 1 in the capital. The kindergarten can accept 55 youngsters aged from two and a-half to seven on a paid basis for a full day and 65 from low-income families for a year free of charge for a course of remedial care, reported astana.gov.kz. “It is important for a child with special needs to be provided with timely remedial assistance in educational institutions for further successful socialisation. I would like to note that the victorious results of our foundation’s activities are the admission of 15 children to secondary schools in the city,” said Co-Make Public Foundation Director Irina Kalyuzhna in her speech at the opening. According to the Psychological Medical Pedagogical Committees (PMPC), 7,557 children with special needs currently live in the capital. Rehabilitation and social adaptation are vital issues for their parents. In an effort to solve the issues, the city akimat (administration) transferred the non-residential premises to Astana Social and Entrepreneurial Corporation (SEC) and approved the programme as an effective use of municipal property. At least 60 percent of non-residential premises will be designated for social projects and approximately 5,400 square metres have been leased for projects such as the kindergarten. 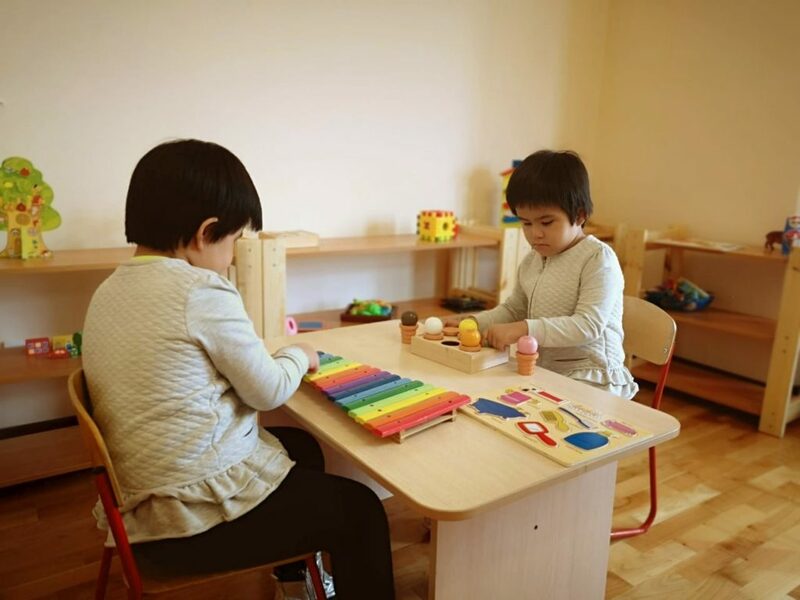 “The opening of an inclusive kindergarten is a big and important event in the life of the capital, since this preschool institution is an early stage of inclusion, giving children the opportunity to fully adapt in society and study in secondary schools along with other children. We are glad to be part of such a project… The SEC will continue to work on supporting socially important projects in the capital that help our country to develop,” said SEC acting Chair Rustem Kuanyshbayev at the opening. Ombudsman for Protection of Children’s Rights in Kazakhstan Saule Aitpayeva, Deputy Chairperson of the National Commission for Women and Family and Demographic Policy Yelena Tarasenko, Senate Deputies and Representatives of the Presidential Administration, Ministry of Education and Science and PMPC attended the event. “Inclusion is more than just being together. This is the process of creating an appropriate environment for all children, which, in turn, means the need to adapt education and training programmes to the needs and interests of children and not vice versa. It is gratifying that topical projects for children with special educational needs are being created in Kazakhstan,” said Aitpayeva.